Manouche UK AnnouncementAnnouncement from Manouche main site. The lineup for March Manouche 2017 has been announced! Get your tickets here! 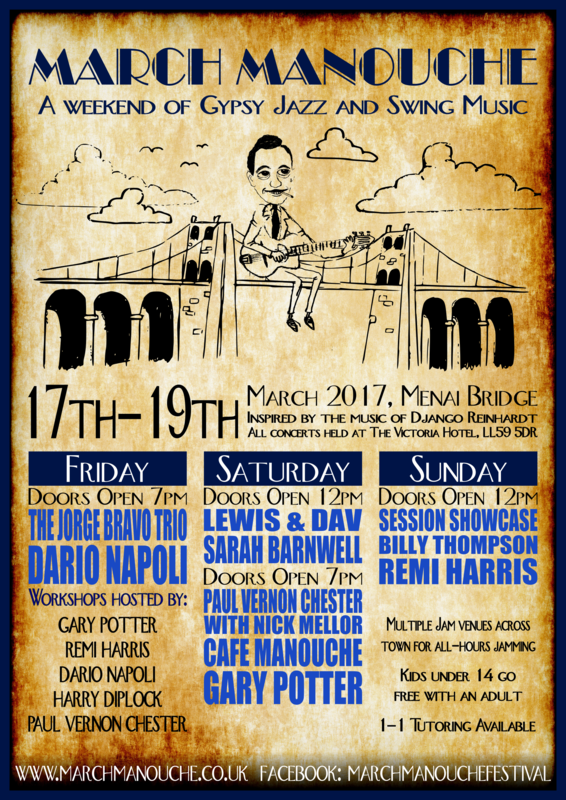 A weekend of Gypsy Jazz and Swing Manouche set in the glorious town of Menai Bridge. The 2017 edition of the festival will include concerts throughout the weekend, workshops from top players, and 1 to 1 lessons. Slight adjustments to venues this year mean that all of the concerts will now be held in The Victoria Hotel (so no more freezing our socks off on the pier on the Saturday night!) and the workshops and late night jamming will be held just a short, 5 minute walk over the bridge in The Antelope. We will be hosting our first international act, as well as exciting artists from all over the UK. This year's festival is going to be bigger and better than ever - we can't wait to see you there! Well worth the trip to North Wales to hear some fantastic players and enjoy some fine jam session around the towns great pubs!